I'm that person - the one who, while sitting in a relatively quiet coffee shop, gasps audibly when stumbling upon well-designed interiors...which is exactly what happened when I laid eyes on Howie Guja's images from this beautiful, iconic and historic structure. The Osborne, an ornate 19th-century apartment building located at 205 West 57th Street in Manhattan, sits catty-corner from Carnegie Hall. It is a New York City landmark (1991) and on the National Register of Historic Places (1993). The eponymous building, constructed between 1883 and 1895, was the brainchild of a stone contractor by the name of Thomas Osborne. It was designed and built by James Ware, an architect who was an early designer of fireproof warehouses. More than 135 years since its initial construction, it is still a highly coveted residence. 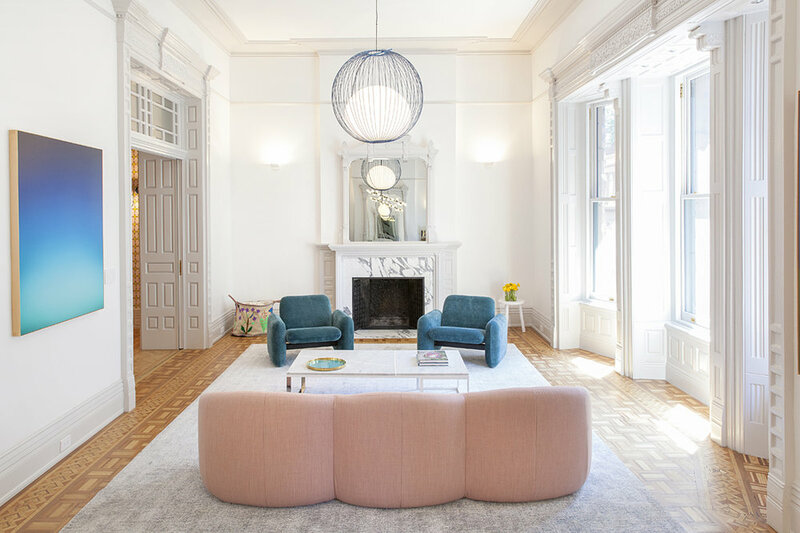 One of the building's apartments, now occupied by a young couple and their children, was updated by Laura Flam of Reunion Goods & Services and Jacob Sandmann of Fogarty Finger Architecture. 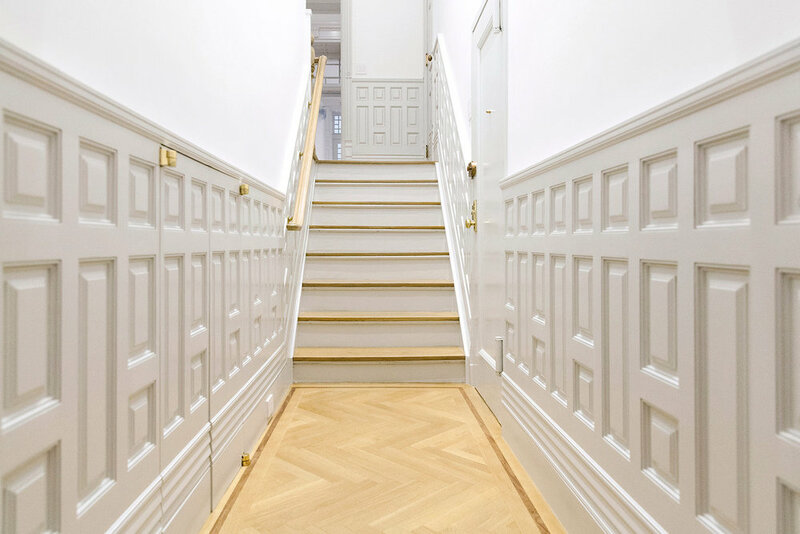 What I love most about the space's modernization is that the historic details weren't stripped away, and that so much of the building's charm was retained in the updated design. The transformation, which blends elements of old with elements of new, does so seamlessly. The architectural bones still shine through despite the 21st century appearance. Enjoy! I hope this inspires you. Photographs courtesy of Howie Guja and used with permission. Thank you, Howie! 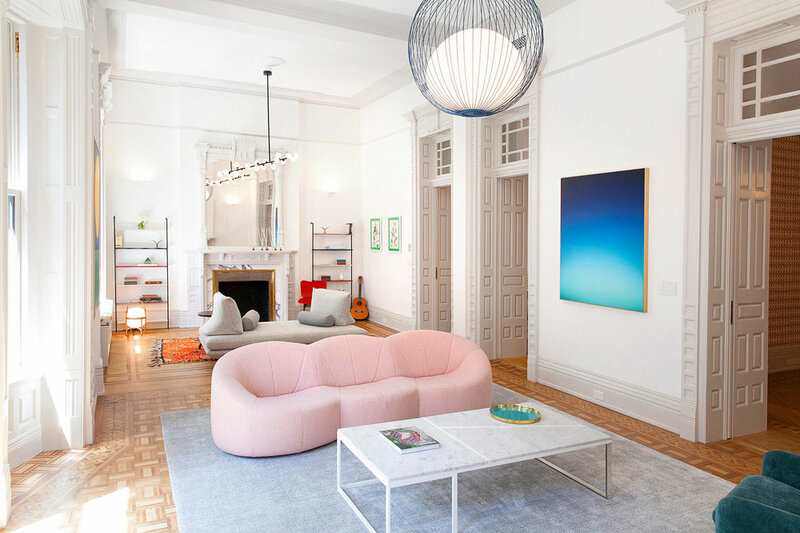 The living room features a light pink S designed by Pierre Paulin for Ligne Roset, the Nour pendant by Julie Pfligersdorffer and a photo from the Sky Series by Eric Cahan. 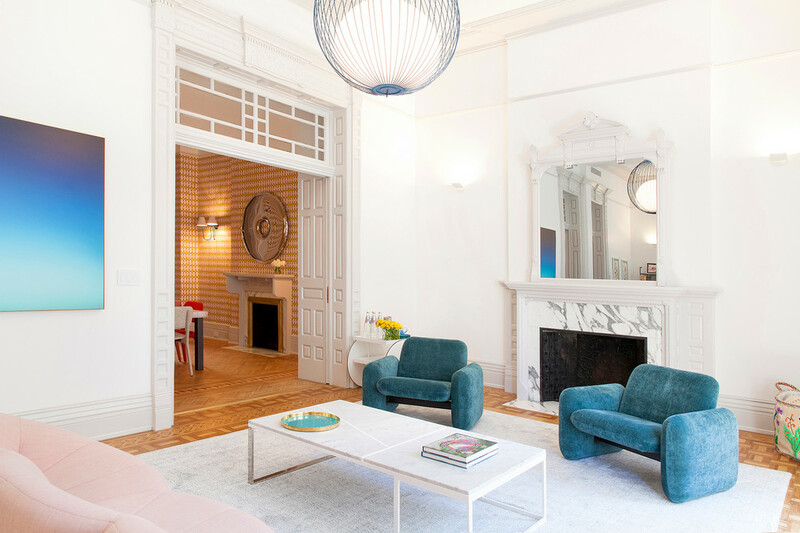 On the far side of the room there is a Prado daybed from Ligne Roset and the Mimosa Pendant by Atelier Areti . A pair of vintage Chiclet Armchairs, designed by Ray Wilkes for Herman Miller, were covered in Rogers & Goffigon blue chenille fabric. Brilliant! The woodwork in the doorframe is original. Original parquet floors, intact. Mic-drop! 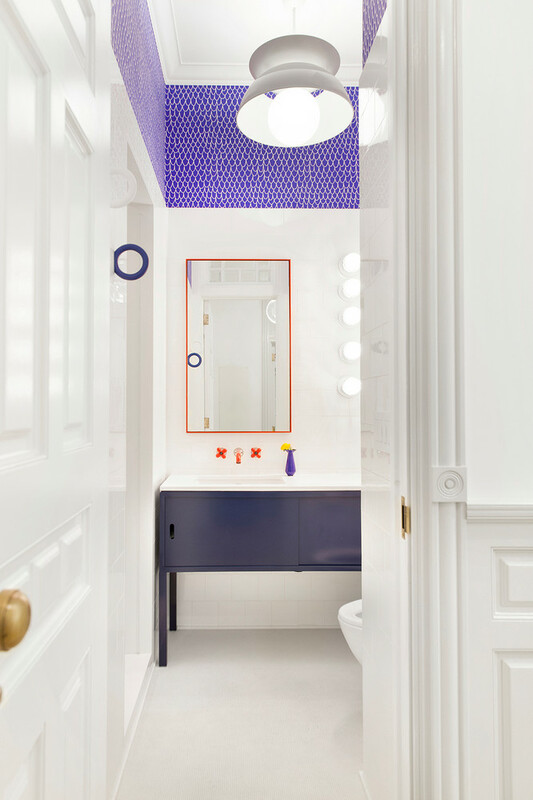 I love the splash of color that was achieved by the sea-blue scalloped wallpaper, along with the fixtures from Fantini. The wallpaper was designed by Eley Kishimoto, the same surface designer who created the custom pattern in the dining room. 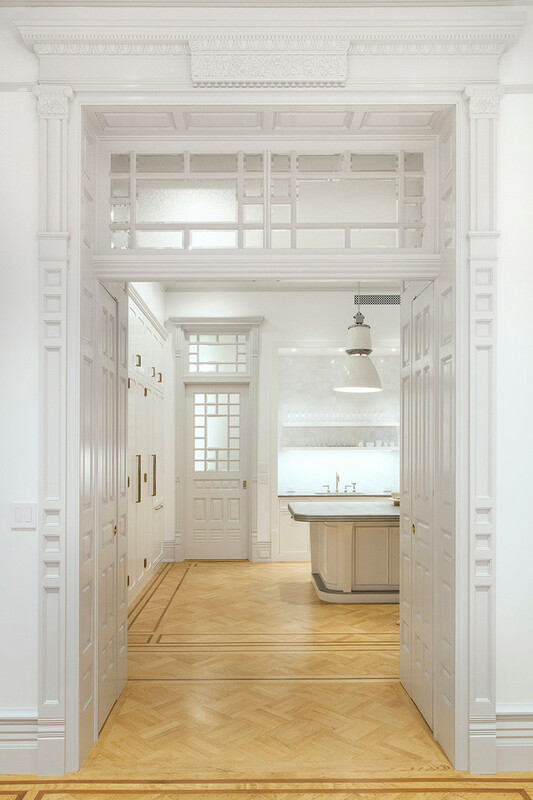 The restoration and additional millwork throughout the apartment was done by Katsura Construction. The lead-paned windows are original to the residence. The perfect use of tile is on display. The azure-blue mosaic floor tiles are from Mosaic House. The boy’s bedroom is wallpapered with a custom design by Rebekah Maysles and Reunion. The yellow table lamp is from Jieldé. 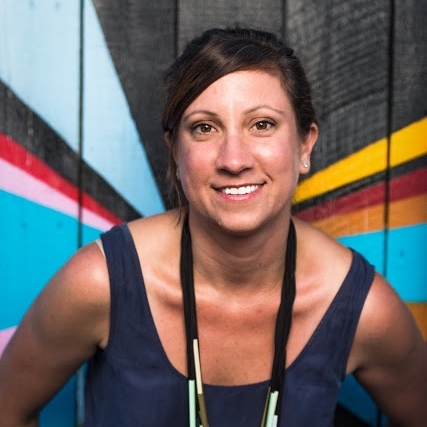 The polka-dot-painted walls are the work of Cassandra Holden . I LOVE how this space was utilized; it's no easy feat to make a triple bunk-bed (designed by Reunion) look light and airy. The Northmore Minor fabric was designed by Rachel Parker for Studio Flock. The pattern is digitally printed in a lovely mix of bold bright and fresh colors on crisp white linen. I just fell over, THUMP! The wood paneling in the foreground is part of the new transformation, and was made to match the original section above. There's even built in storage space; it's a New York City miracle!